Ever Since Windows Phone 7 Mango was launch, the idea of having a People Hub changed the dynamics of having one common address book for all your contact, synced. I personally believe that HTC Sense with Auto Contact Sync was a idea fetched from Window 7 Business Phones HTC and Dopod released at those time. With all contact in place, we were able to see all latest updates, birthday reminders, pictures, videos etc, fetched from all our social media accounts Facebook, Windows Live, Twitter, LinkedIn. Unfortunately, where Android re-visited the idea of having a central contact address book, Microsoft removed this feature in Windows Phone 8.1. But great news is that with the launch of Windows10, People App has been re-tweaked, re-thought by the Microsoft team. One of the prime reason is also that the Feedback from Insiders have been prominent and the team has addressed those concerns time to time with revised version updates. With the latest Xbox beta app installed on Windows 10 Redstone Build 14295, you can now have Xbox contacts integration on People Hub directly. 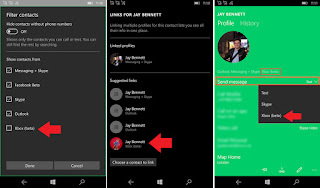 Once the build is installed on your device, you can head to the People App and click on what contact to sync, you can link your XBox Contacts with your existing contacts if desired. If you have latest Windows Redstone insider build running, try out this feature and let us know your experience. In time to come, there would also be SMS based XBox Integration where you would be able to choose whether you want to message someone via skype, Text or Xbox. Are you an Xbox user and do you have your contacts which would love see them in your People App on Windows 10? Share your views in comments section below.